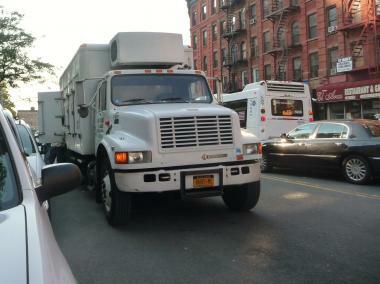 A truck parked on a street in the Bronx. A group of Bronx politicians say the city is dragging its feet in enforcing a law to increase traffic fines for tractor trailer trucks that park illegally on residential streets overnight. PELHAM BAY — A group of Bronx politicians say the city is dragging its feet in enforcing a law to increase traffic fines for tractor trailer trucks that park illegally on residential streets overnight. A 2010 law introduced by State Sen. Jeff Klein, City Councilman James Vacca and Assemblyman Michael Benedetto to reduce noise and pollution to neighborhoods and to prevent the trucks from taking up precious parking spots upped the penalty for the violation from $65 to $250, and $500 for repeat offenders. But the pols say the city's Department of Finance has yet to print new parking tickets with the heftier fines on them, meaning many truckers are only getting busted with the cheaper $65 penalty. "That was basically the cost of doing business for these truck drivers, because it's cheaper than a hotel room," said Klein's spokesman Eric Soufer, who said the lack of new parking tickets "totally undermines the purpose of passing the law to begin with." In a response to the elected officials' concerns, the Dept. of Finance said in a letter last month that it has updated its fine structure to reflect the new law, "but we are not able to list every violation on the handwritten tickets," and that traffic enforcement officers can write the steeper penalties on tickets themselves. But the Bronx politicians say the city hasn't instructed the NYPD about the new fines. "This is somewhat typical bureaucratic inaction," Soufer said. The 2010 law was passed in response to complaints from constituents in the elected officials districts — primarily in eastern Bronx neighborhoods like Throgs Neck and Pelham Bay — where they say truck drivers pull off the highway and park for the night, taking up much of the street and often leaving their engines idling. "It's a major problem for us," said Kenneth Kearns, district manager for Bronx Community Board 10, where three major highways run through the neighborhood of Throgs Neck, making it a major stopping off point for truckers. "They have residential space in the back of their trucks and they sleep there, and in order to keep the air conditioner going, they keep the engines running," Kearns said. "They take up three, four or five parking spaces. These guys don’t care." Klein's office said they tracked popular truck parking locations in his district, which includes Riverdale, Morris Park, and much of the northeast Bronx, and estimate that 238 tractor trailers park overnight in the district on average each week. Klein's office calculated that if each of these drivers were slapped with the higher fines, it would add up to over $3 million in revenue for the city. "These are real dollars: dollars that could be going towards our schools, towards after-school programs, or to our police and fire departments," Klein said in a statement Thursday. Kearns said the local police at the 45 Precinct have been stepping up their efforts recently to slap the rule-breaking trucks with the steeper fines. "The police have been very receptive," he said. "Maybe with a rash of tickets these guys will get the message."